A group of "foodies" had an early rise and a 220-mile (354km) round trip - all for the love of a pasty. 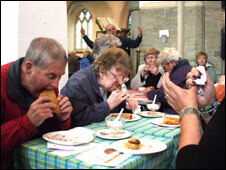 More than 100 people boarded two coaches in Bristol and travelled to Kingsbridge in Devon to enjoy a pasty lunch. Gerald Creed, from Bugler Coaches, organised the trip after tasting what he believes is "the finest pasty in the land", made by Lidstone's butchers. "Wonderful - worth travelling all that way," one replete diner said. The traditional family butcher's shop has been trading in Kingsbridge for more than 100 years. Lidstone's manager Chris Sroka said the "secret" to the recipe was using the best quality local ingredients. "We use the finest quality beef from our farm at Blackawton and potatoes from a local grower - that makes all the difference," he said. Mr Sroka said it was his biggest single order, but his only concern had been keeping the freshly-baked pasties warm for the two lunch sittings, organised at the local church next door. The pasties, accompanied by cups of tea and some acoustic guitar music, delighted the daytrippers. 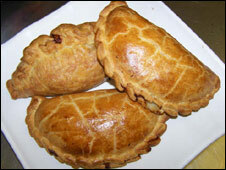 "They were absolutely delicious - bursting full of meat and potatoes and the pastry was just perfect," said one woman. Mr Creed said the success of the trip confirmed that Bristolians were renowned for their love of good food. The comments were sweet music to head baker Simon Prowse who had started making the hand-crafted flat pressed pasties at 0500 GMT - with a little help from his wife Pauline.